Kate Middleton looks demure in a Missoni coat at the Somme Centenary commemorations | HELLO! 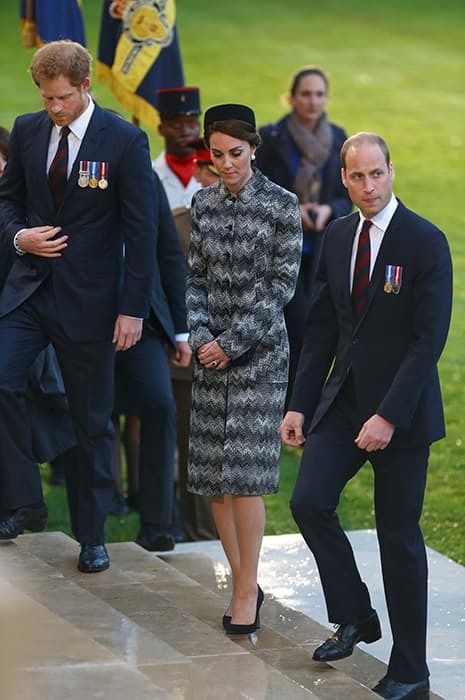 The Duchess of Cambridge, née Kate Middleton, cut a demure figure as she joined her husband Prince William and brother-in-law Prince Harry at the Somme Centenary commemorations on Thursday evening. Kate opted for a black, white and grey Long Snake Stitch Coat by Missoni for the solemn occasion. The coat, which features the label's signature zigzag print, retailed at £850 but is no longer available to buy. The Duchess completed her look with a vintage-style pillbox hat, suede black Gianvito Rossi heels, a black Mulberry Bayswater clutch and oversized faux-pearl earrings. With her hair pulled back in an updo, and wearing natural make-up, it was a low-key and respectful look from the Duchess, who had travelled to France for the event. It's the first time that Kate, 34, has worn the Missoni coat - although eagle-eyed fans will have recognised her faux-pearl Balenciaga earrings, which she also wore to Trooping the Colour earlier this month. The earrings, which feature a magnetic back, are described as "silver tone brass studs which showcase a supersized fauz-pearl centre", and are currently available for £415. The battle of Somme took place on July 1 1916 and is known to be the deadliest battle in British history, and the royal family are attending events across the commonwealth to mark the battle's 90th anniversary. 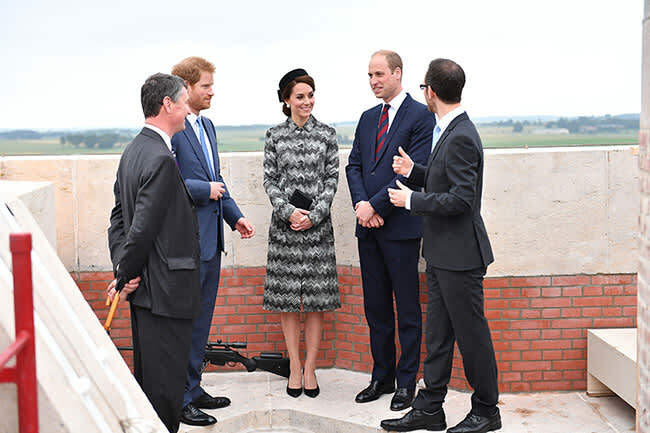 Prince William, Kate and Prince Harry attended an event at the Thiepval Memorial on Thursday evening, which commemorates British soldiers who died without graves and lit up for the first time ever in honour of the occasion. They also attended a military vigil and a meeting with representatives of countries who fought in the Battle of Somme.